Image: Julie Hartwig. Bailey White is quite an active President of the US A-Class Association, promoting the As locally and at international level with their great NAs 2015 coverage. US & CAN Association have presented a bid to remove Rule 8, and last month Bailey consulted Glenn Ashby on his thoughts. To counter balance Glenn's view, Bailey contacted the other great Master of the As Sailmaker & 2011 World Champ Steve Brewin to get his view on the Class development. Below Q&A I received this weekend. -Bailey White: How you think about the A after all of the experiences you now have across other boats you have sailed? Steve Brewin: The A class is my favorite boat and always will be, it has always been the leader of the pack and a nice boat to sail even when you are on your own. When foiling first came in I was excited about the future. I can tell you that it has been great to learn a new style of sailing over the last year has made me keener than ever before to just want to go for a burn, so so much fun and learning at this time. - Bailey: Should we keep rule 8 or any portion of it? What does your experience tell you will make the A sail its best, be the most fun, and stay relatively inexpensive in the years to come? Stevie: At this time I voted to keep rule 8, not saying that that is what other people need to follow as we all have different looks and ideas about the rule and future. The reason I voted this way is because right now I am foiling very well on the A cat and reaching extremely good speeds, downwind in particular. I don’t record speed often, but in 12 knots of breeze I am normally about 22 knots downwind though have been recorded as high as 28.
and going to designs that allow you to keep both boards down for tactical reasons. I am pretty convinced that if rule 8 goes, then windward boards will be getting raised. This will make it harder for a lot of people. I feel that both boards down help you balance the boat. When the windward hull dips the foil lift kicks in and helps push you back up and likewise when flying hull it works the other way. I see a lot of people getting washed of when foiling with one board up, essentially two Z boards are like a V board with a 1.5 meter gap at the bottom; that’s why they work best at this stage of the development. I wasn’t sure. Right now any votes are only to decide whether to go to ballot, so people can change their mind if we get to the ballot. At the worlds in NZ I was sure that rule 8 was a mistake, 18 months later I am not so sure. I do believe the boats will get a lot more expensive to run without rule 8, more development and material costs. That part doesn’t worry me, but we need to be mindful of the majority of the fleet and future growth of the class. What we do need is certainty, and boats need to stay affordable. Any V style foil will be bad if there is weed. Right now we can get the boards up to get rid of it. Also we need to be mindful of us not turning into a moth style boat with the hulls becoming training wheels, as many things are possible without rule 8. I am seeing guys testing moths without wands at the moment and it is possible to get this style of moth foil working without a wand, as wands are not allowed under ISAF rules, unless we as a class vote in to create a wand allowing rule. On my moth I broke my wand once and managed to sail home with my thumb controlling the lift of the flap at the ball joint. This is hard to hold and do, but with a lever would be very easy to replace the wand with a hand adjustable wand that is not automatic but is controlled by the person. It will then pass ISAF rules. 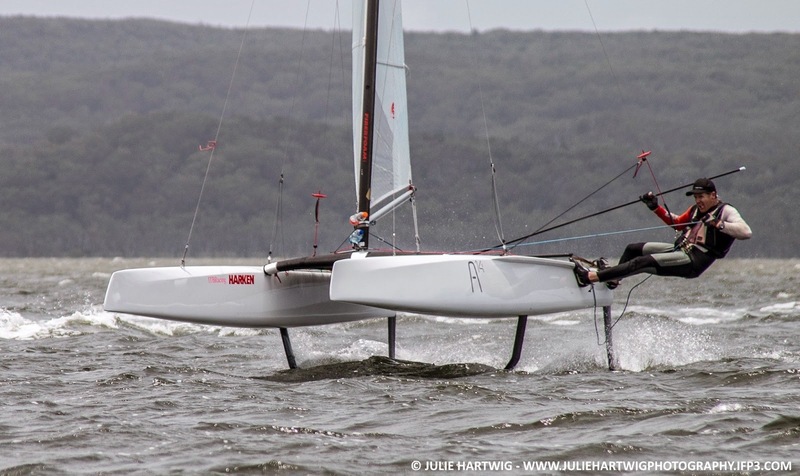 I feel that there needs to be a rule to keep the A cat catamaran like, so I feel that there still needs to be some sort of gap rule and a number of foils allowed. Basically development will go crazy without rule 8. It won’t be as simple as just a V style board. Also I feel that rule 8 has helped us stay within a good drag factor. I am sure we are getting enough lift surface within the rule. The idea of class rules is to develop within them and keep boundaries. I feel any country putting up proposal of getting rid of rule 8 should consider replacing the rule within the proposal, ie proposing still some sort of a gap rule for example 1 meter. - Bailey: Some people have specific concerns about putting boards in from the bottom. If we open up foil development, will all boats go to boards from the bottom and will this change the experience of the A and the ability of sailors to rig it up by themselves and go sailing? Stevie: I don’t think foils in from bottom will be a big issue. It will not be hard to rig, just a bit of a bugger landing on the beach in big chop, and problem getting weed off and plastic bags etc. - Bailey: The potential performance of cats keeps getting redefined by the Americas Cup. We are seeing new levels of roll tacks and foiling on the AC45s already just as the teams are warming up for the next cup. Will the A ever get to this level? Does rule 8 have to go if so? Stevie: I am sure we will be able to get better upwind speed without rule 8 as we will be able to have better righting moment with raising boards. Downwind will be great no matter what happens. We will foil upwind with rule 8; it just a matter of the efficiency. - Bailey: For me personally, the A class is a perfect combination of amateur fun and exposure to some of the best in sailing, with everyone passionate about high performance. How would you describe it? Who do you think are the kinds of people that should get into the class? Stevie: That is exactly it. I agree. All types of people should get into the class. There is always someone to race against that has similar gear and level of sailing. We can’t all be world champions, but we can all have our own goals from top 5 to top 10 to top half to even beating a couple of guys around you at the back of the fleet. Remember we have all been last at some stage in our career, but there was someone near us we were trying to beat. If your on an A cat, then you are sailing on a boat that is simply the best. The problem we can face if boats get expensive, ie wands etc, it will be hard to get new sailors to the class and also to retain sailors. At the end of the day I will still be happy in the A class no matter what the outcome of rule 8. It is questionable we have always been the leader, so are we getting left behind the rest of the world? Or do we have a rule that keeps some part of simple in there, and keeps us as what a catamaran is?